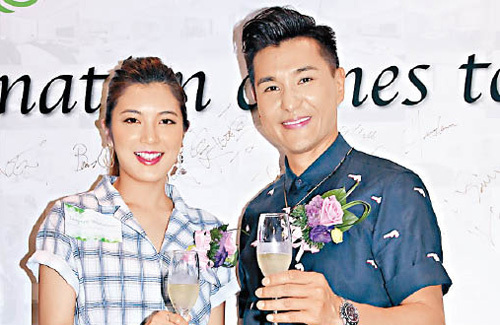 Having always preferred to keep his private life low-key in the past, Ruco Chan (陳展鵬) surprisingly admitted dating Phoebe Sin (單文柔) last year, and most recently, indicated that he has intentions to wed the ex-Miss Hong Kong contestant. Despite the cute banter, Ruco stressed the importance of being allowed some privacy in handling their relationship. His char is billed as anti-hero but he’s not turning out that way. He’s the typical TVB claims to be different but turns out to be a cheap cop out. @jjwong same… that’s one terrible makeup, it’s like he just go: hey babe, can I borrow your lipstick? No, I’m sure it’s just bad, over-saturated image editing. That is a terrible picture. It’s like someone went crazy on the “I feel lucky” autocorrect function of photoshop. Ruco’s character isn’t really an anti-hero or even a tragic hero. He’s just not a hero. He’s a villain with a few redeeming qualities, but a villain never-the-less. Which can be entertaining if he is smart and has fun being evil. Shaun Tam’s character is more of the tragic hero. Joel might be an anti-hero. Jonathon is the hero. The one episode = one day trick is wearing down on the drama. It does not let big emotional events sink. It has been throwing new elements in with little build-up in order to give a “twist”. The way characters pop up in different cities at the speed of light is silly. Drama is still interesting. Ruco was more villainous in Episode 22, but I want more evil. Anti-hero is someone who does things for the greater goods eith unconventional Gary Stu heroic methods. The Punisher. Deadpool. TVB HS is a cheap attempt to claim a new twist on HS. He turns out to fit TVB and see lai worshipped “hero.” HS has the standard heroic traits: romantically loyal, take care of his bros, outsmart all obstacles, and justifiable/lovable actions. Haha. It’s quite sad when they have to clap enthusiastically every few minutes to gain some TV time. The desperate girls are all standing hoping for a camera zoom in during a clapping sequence. Lol. I thought he’s wearing a lipstick or something. ruco is 41…happy he has found his Miss Right. hope Kenneth Ma will be next to get married.